He was nominated because of his great spirit. Chandler has the drive to always over achieve. 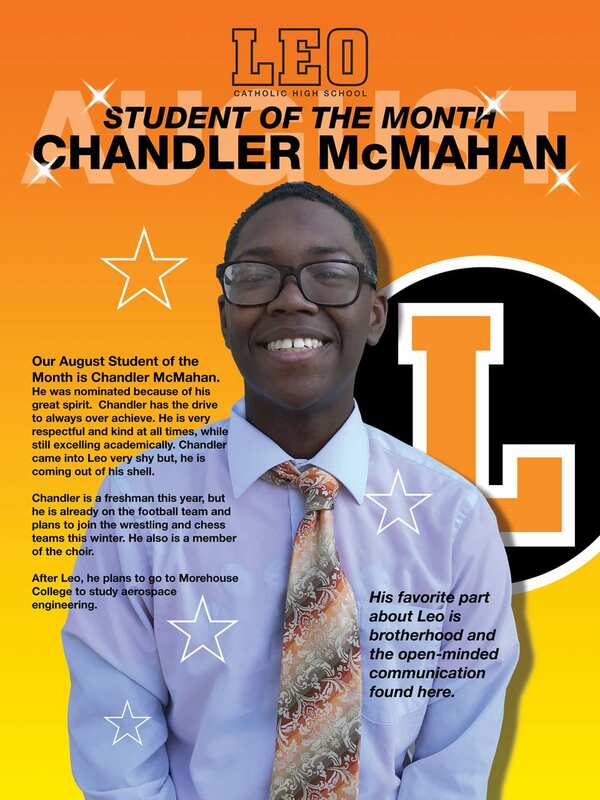 He is very respectful and kind at all times, while still excelling academically. Chandler came into Leo very shy but, he is coming out of his shell. Chandler is a freshman this year, but he is already on the football team and plans to join the wrestling and chess teams this winter. He also is a member of the choir. 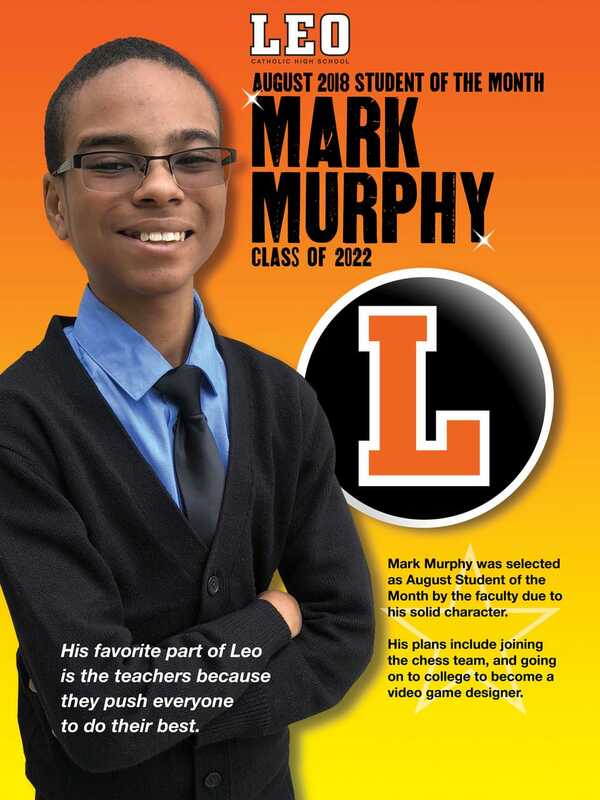 After Leo, he plans to go to Morehouse College to study aerospace engineering. His favorite part about Leo is brotherhood and the open-minded communication found here. 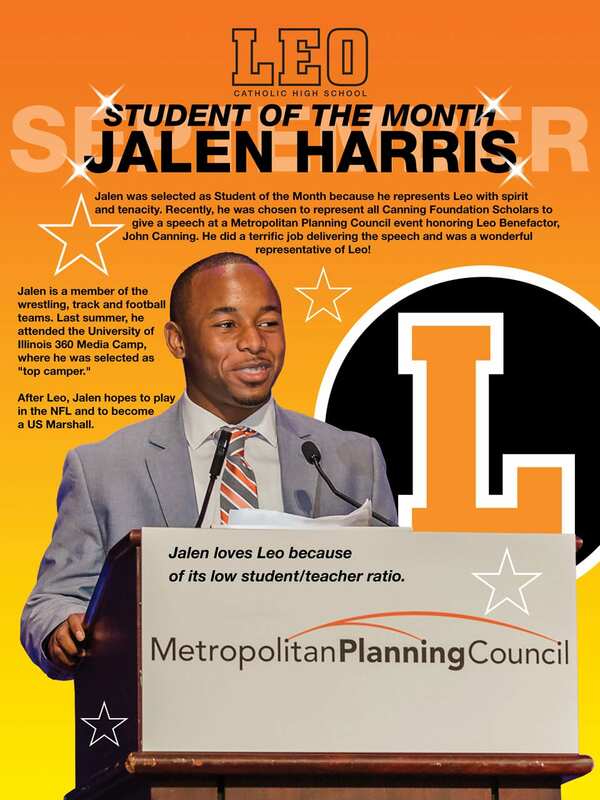 Jalen was selected as Student of the Month because he represents Leo with spirit and tenacity. Recently, he was chosen to represent all Canning Foundation Scholars to give a speech at a Metropolitan Planning Council event honoring Leo Benefactor, John Canning. He did a terrific job delivering the speech and was a wonderful representative of Leo! After Leo, Jalen hopes to play in the NFL and to become a US Marshall. Jalen loves Leo because of its low student/teacher ratio. He was nominated for his outstanding character and grades. These were even noticed by members of the Chicago Bar Association as they worked together on a recent project. Pierre was a receiver, cornerback, and participated in special teams for the freshman football team. He plans to run track later this year. After Leo, Pierre plans to have a career that will keep him financially stable. The vibe and the brotherhood are Pierre’s favorite parts about Leo. He exemplifies the balance of academic proficiency and social maturity that successful students exhibit even beyond the level of secondary education. He is confident, but not arrogant; smart, but not overbearing. 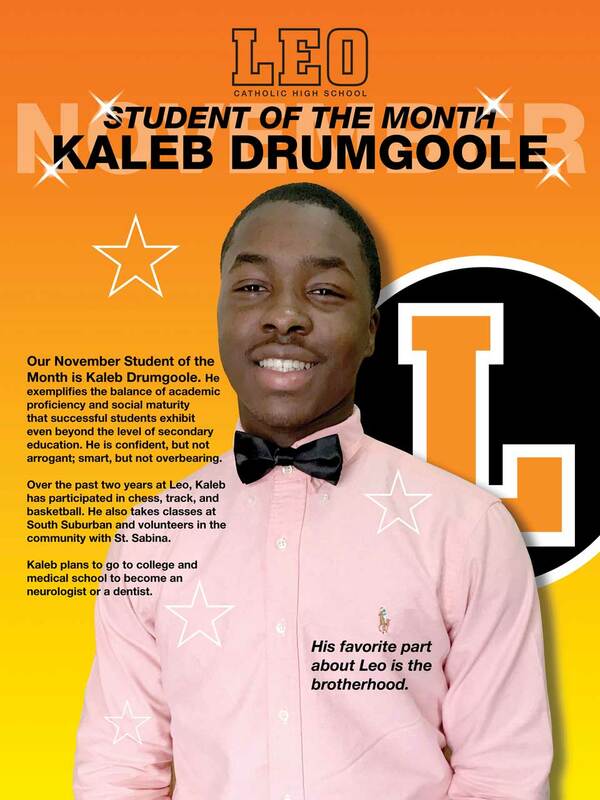 Over the past two years at Leo, Kaleb has participated in chess, track, and basketball. He also takes classes at South Suburban and volunteers in the community with St. Sabina. Kaleb plans to go to college and medical school to become an neurologist or a dentist. His favorite part about Leo is the brotherhood. because he has improved a lot academically, is very focused in the classroom and always stays after school to finish his assignments. Since coming to Leo, he has participated in wrestling and football. 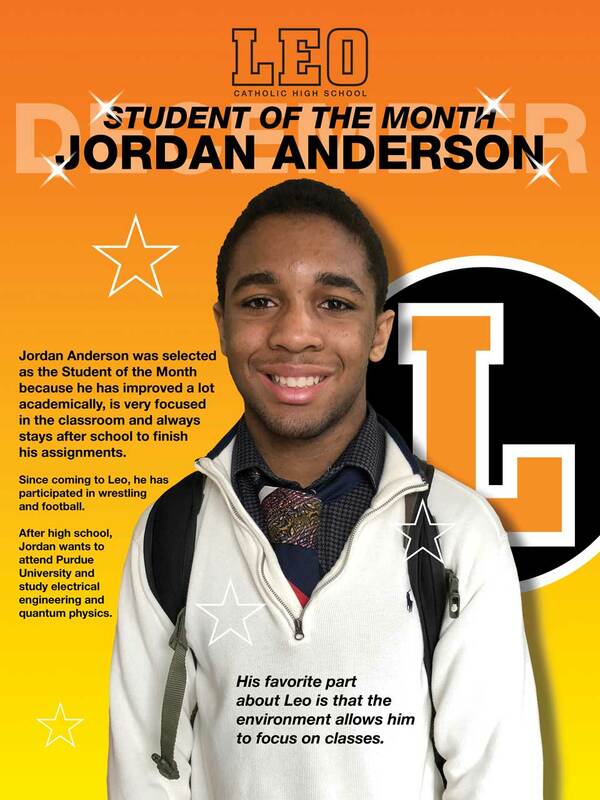 After high school, Jordan wants to attend Purdue University and study electrical engineering and quantum physics. His favorite part about Leo is that the environment allows him to focus on classes. Fred was selected because he is always ready to participate and does all of his work. He is very polite. 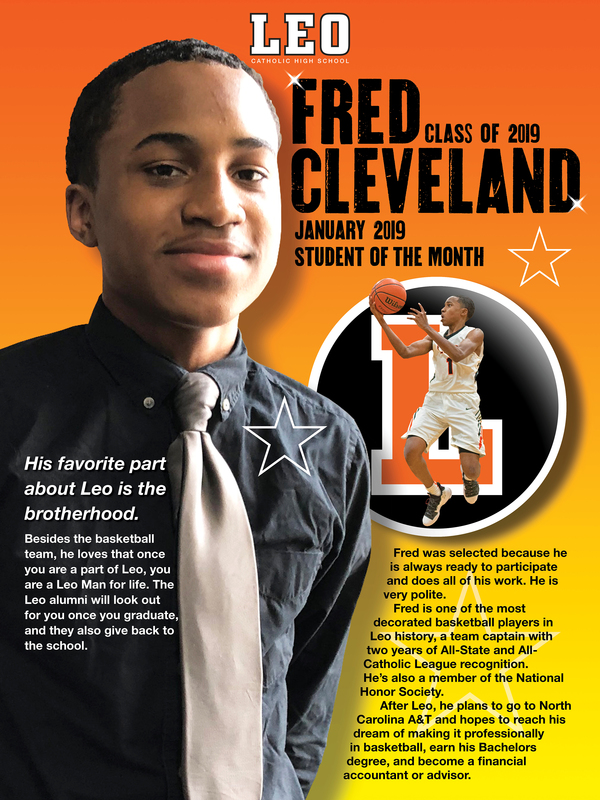 Fred is one of the most decorated basketball players in Leo history, a team captain with two years of All-State and All-Catholic League recognition. He’s also a member of the National Honor Society. After Leo, he plans to go to North Carolina A&T and hopes to reach his dream of making it professionally in basketball, earn his Bachelors degree, and become a financial accountant or advisor. Besides the basketball team, he loves that once you are a part of Leo, you are a Leo Man for life. The Leo alumni will look out for you once you graduate, and they also give back to the school. 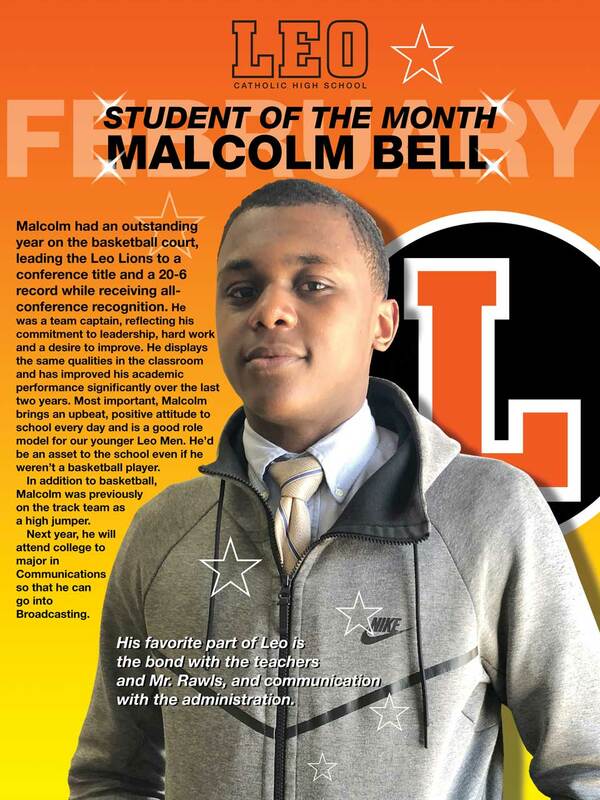 Malcolm had an outstanding year on the basketball court, leading the Leo Lions to a conference title and a 20-6 record while receiving all-conference recognition. He was a team captain, reflecting his commitment to leadership, hard work and a desire to improve. He displays the same qualities in the classroom and has improved his academic performance significantly over the last two years. Most important, Malcolm brings an upbeat, positive attitude to school every day and is a good role model for our younger Leo Men. He’d be an asset to the school even if he weren’t a basketball player. In addition to basketball, Malcolm was previously on the track team as a high jumper. Next year, he will attend college to major in Communications so that he can go into Broadcasting. 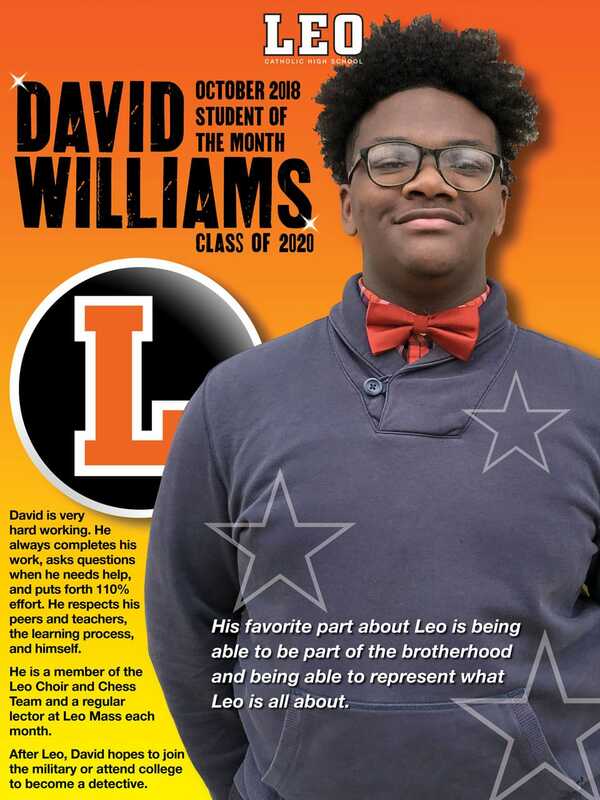 His favorite part of Leo is the bond with the teachers and Mr. Rawls, and communication with the administration. Dejon is ending his senior year with a bang. Volunteering on Saturday with Principal Rawls, raising his GPA this quarter to a 3.7, leading the choir at several performances and helping to mentor young students. He has become a fine young man. Dejon transferred to Leo at the start of his junior year and has been on the football, bowling and track teams and sings in our choir. Next year Dejon will attend Robert Morris in Peoria to study Business Administration. His favorite part of Leo is the brotherhood. Elijah works hard, even when in a more relaxed setting. He is faithful to getting all his assignments completed, and he is studious enough to hold on to those enduring understandings that language learning requires. 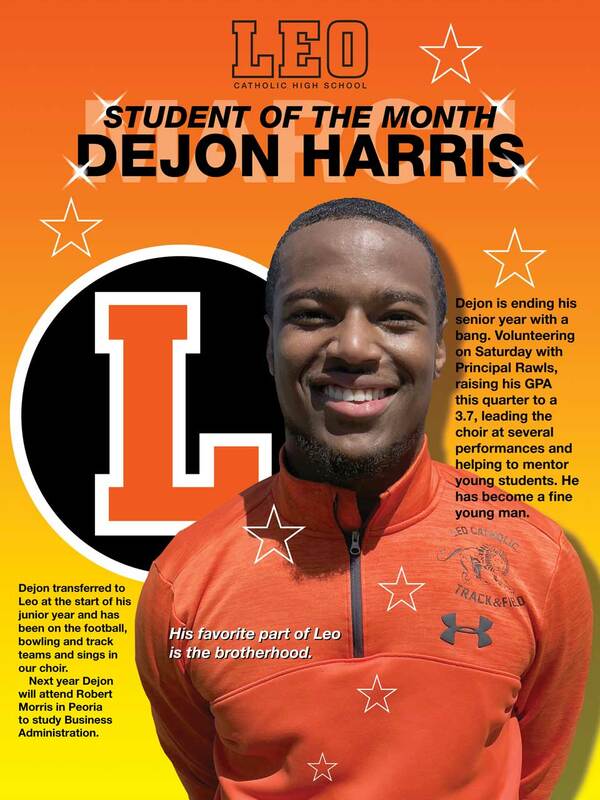 Since coming to Leo, Elijah has been a member of the football, wrestling and track teams. 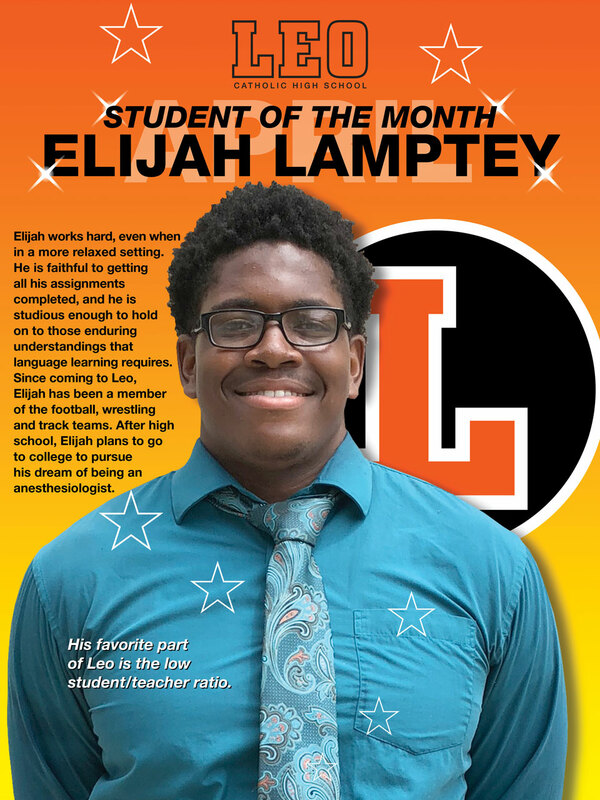 After high school, Elijah plans to go to college to pursue his dream of being an anesthesiologist. His favorite part of Leo is the low student/teacher ratio. 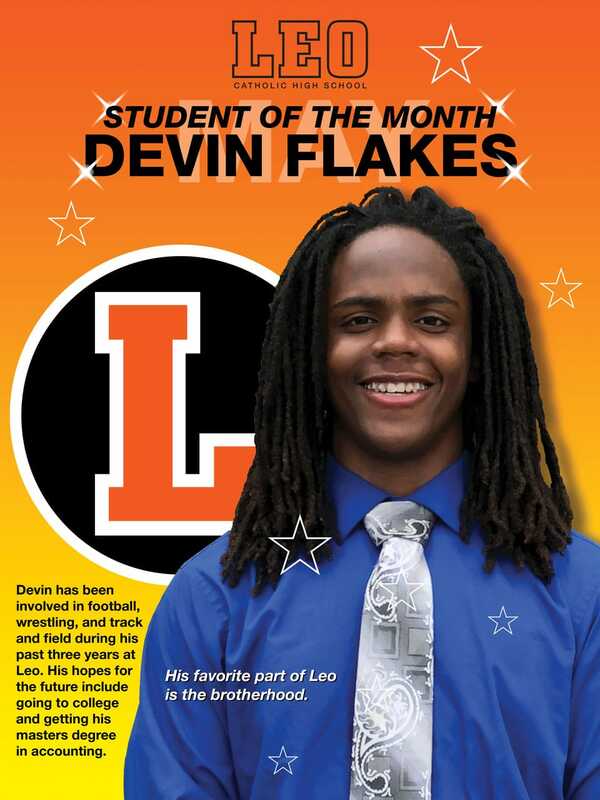 Devin has been involved in football, wrestling, and track and field during his past three years at Leo. His hopes for the future include going to college and getting his masters degree in accounting. Mark was selected as August Student of the Month by the faculty due to his solid character. His plans include joining the chess team, and going on to college to become a video game designer. His favorite part of Leo is the teachers because they push everyone to do his best. Schron Brown was selected as the September Student of the Month because we have seen him mature over the past four years. He gives the Freshmen advice on the Leo Culture and is a role model. He has worked diligently to bring his grades up. After Leo, Schron is planning to attend college where he would like to major in Engineering with a minor in Vocal Music Performance. 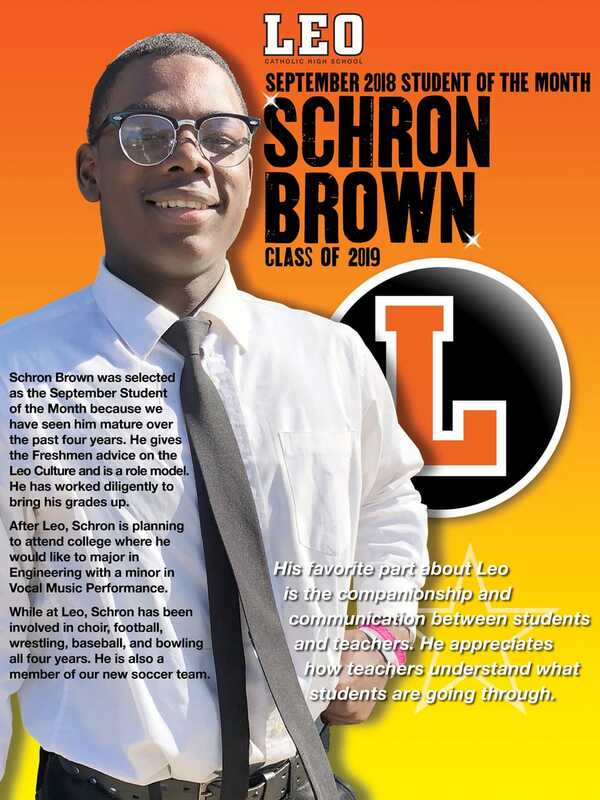 While at Leo, Schron has been involved in choir, football, wrestling, baseball, and bowling all four years. He is also a member of our new soccer team. David is very hard working. He always completes his work, asks questions when he needs help, and puts forth 110% effort. He respects his peers and teachers, the learning process, and himself. He is a member of the Leo Choir and Chess Team and a regular lector at Leo Mass each month. After Leo, David hopes to join the military or attend college to become a detective. 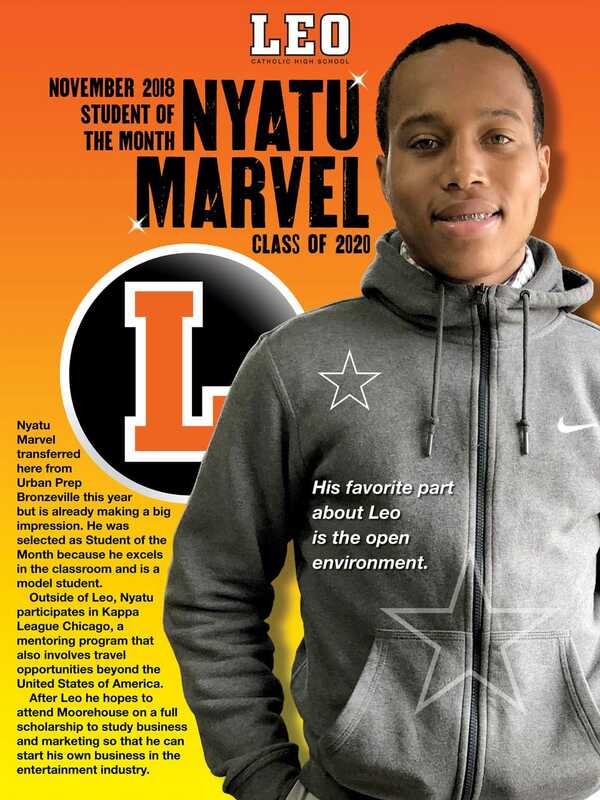 Nyatu Marvel transferred here from Urban Prep Bronzeville this year but is already making a big impression. 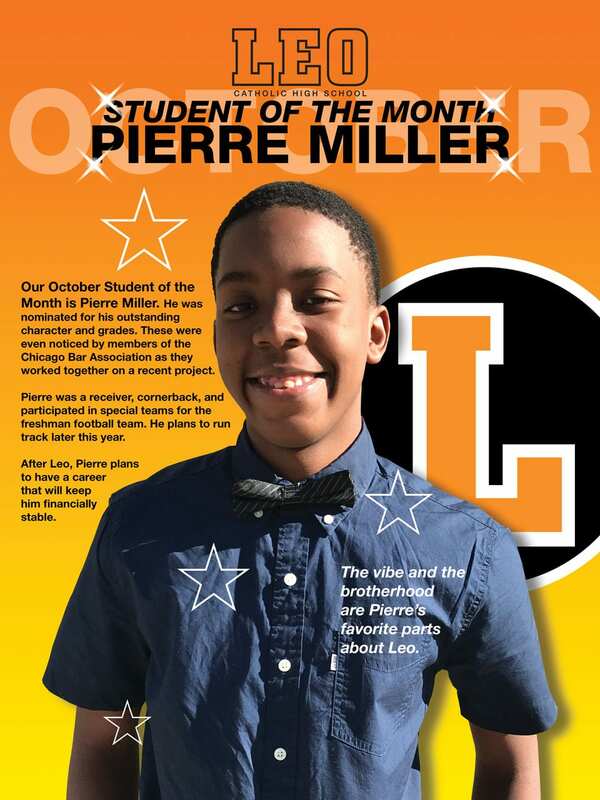 He was selected as Student of the Month because he excels in the classroom and is a model student. Outside of Leo, Nyatu participates in Kappa League Chicago, a mentoring program that also involves travel opportunities beyond the United States of America. After Leo he hopes to attend Moorehouse on a full scholarship to study business and marketing so that he can start his own business in the entertainment industry. 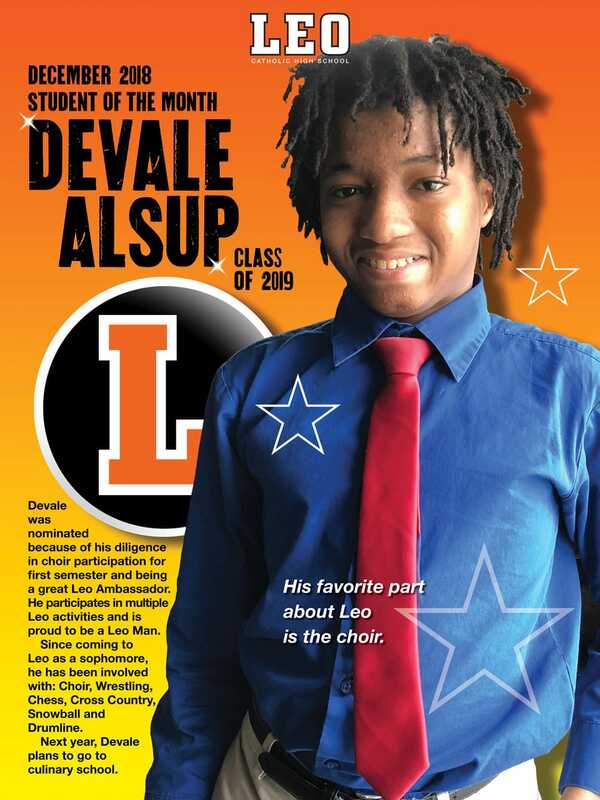 Devale was nominated because of his diligence in choir participation for first semester and being a great Leo Ambassador. He participates in multiple Leo activities and is proud to be a Leo Man. Since coming to Leo as a sophomore, he has been involved with: Choir, Wrestling, Chess, Cross Country, Snowball and Drumline. Next year, Devale plans to go to culinary school. 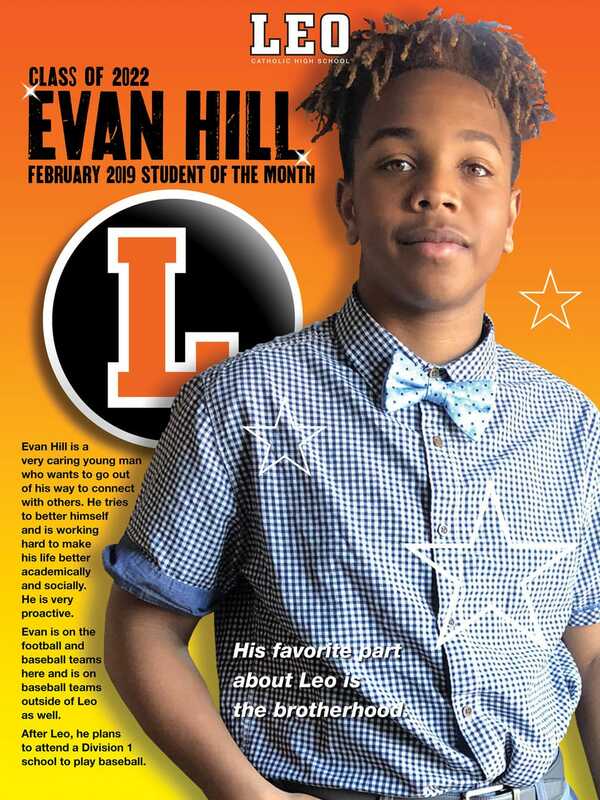 Evan Hill is a very caring young man who wants to go out of his way to connect with others. He tries to better himself and is working hard to make his life better academically and socially. He is very proactive. Evan is on the football and baseball teams here and is on baseball teams outside of Leo as well. After Leo, he plans to attend a Division 1 school to play baseball.